I hope you guys are having a fantastic week! I certainly am having a blast! Thursday was my last move-in shift for moving people into the dorms and I got to meet a bunch of people in my building, so it was really cool. I also worked a shift at the On Iowa! check-in table which was a lot of fun. I worked with a girl from Green Squad and we had a lot of fun teasing each other when we checked-in a student from the others squad. We both got super excited when we meet someone from our color. Yesterday was the big day. The day where we have a single short squad meeting and then get our small groups. We would scream and cheer when we saw Red Team people walking towards us. We also chanted Green Squads roll call back to them, but with Red Squad in it. Both Green and Red were trying to out cheer each other. Red totally dominated. This year the leaders lined up on the sidewalk and two on the end would move to the grass. The first group of 20 students would be paired with one of the leaders. Once they had their 20, they could head to their classroom. 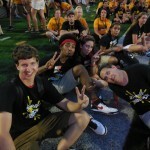 I was so excited to get moved to the grass and get a small group. I ended up with 18 in my group. They were a fantastic group and participated in my whacky icebreakers (that I absolutely love!). We had a little bit of classroom time before heading to the Excel Lecture, which happened to be across the river. It was a great opportunity to get to know my small group better through very diverse conversations. 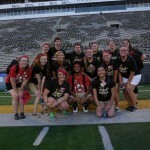 In the Excel Lecture we learned about things to do and not do to be successful at University of Iowa. The professor was really great and asked for student leaders for contributions which, I think, helped the new students hear a current students perspective. After the lecture my group (minus two students who, I think, followed different group when everyone left the lecture hall) played a game to help us learn everyone’s name which brought a lot of laughs and some misunderstandings (“Tiller whales” for one). We have a lot of double names in my group and that made it a bit trickier. After a slight… umm… detour… with my group, we arrived at dinner and mostly sat together. We had a great conversation about classes and some great resources. My small group had a lot of great questions and I know they’re going to have a fantastic year! 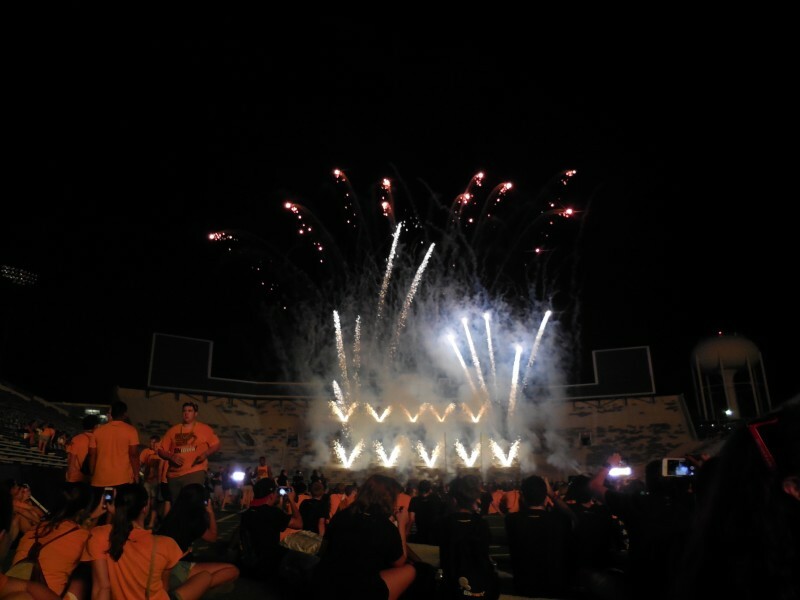 Following dinner, we went to Kinnick and had fun. 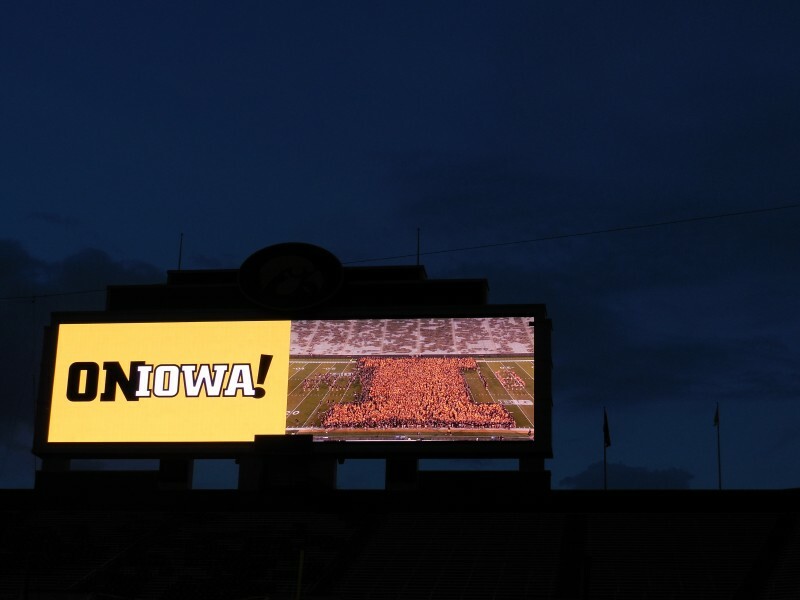 They had a DJ playing music and we took a class picture (On Iowa! 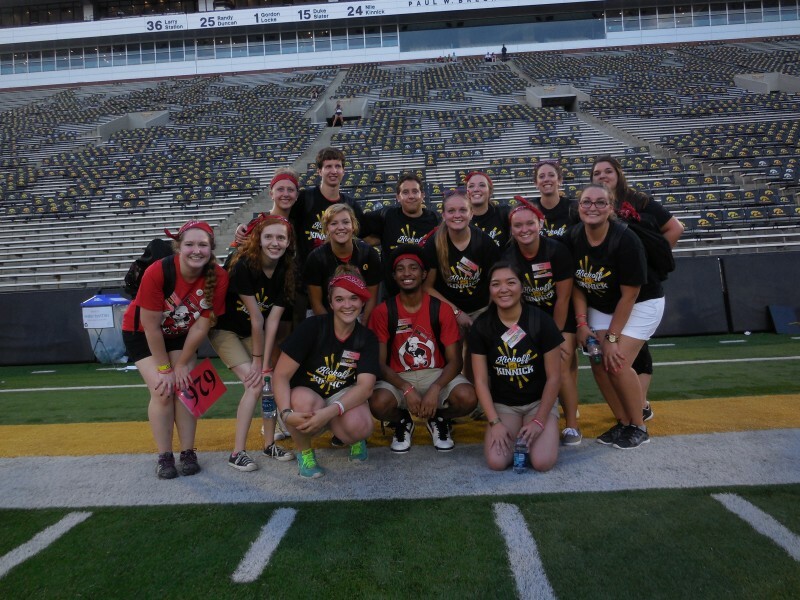 Leaders, RAs, and Band members are the outline) with the class of 2018 in gold shirts. 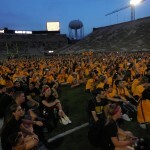 Here’s a picture of my Small Group outside Kinnick in their gold shirts. Aren’t they great?! Red Squad hung out together on the field and had a ton of fun. We even had a tug-of war with multiple color squads. I love my squad so much and the other squads are so awesome. Making the “I” for the class of 2018! 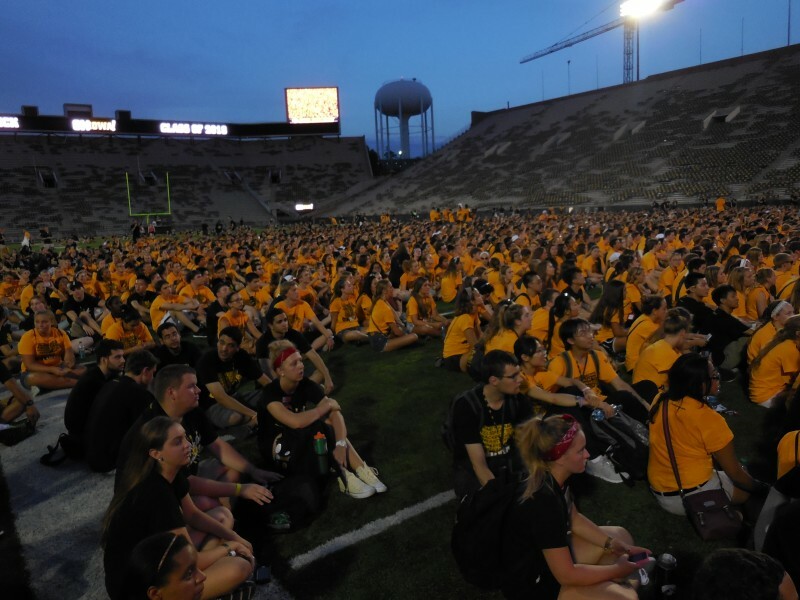 The whole class of 2018 at Kinnick! 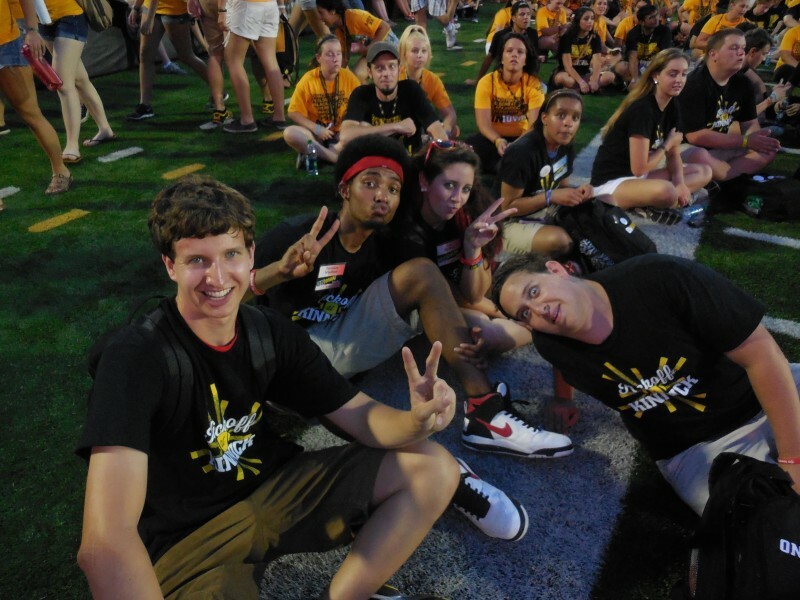 Some of Red Squad just chillin’ on the turf. 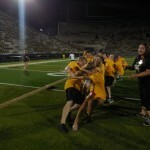 I’m not sure whose idea it was, but we had a gold vs. black tug-of war. The OnIowa! 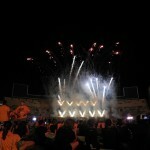 leaders were wearing black shirts from the outline of the “I’ and as I mentioned previously, new students were the gold. 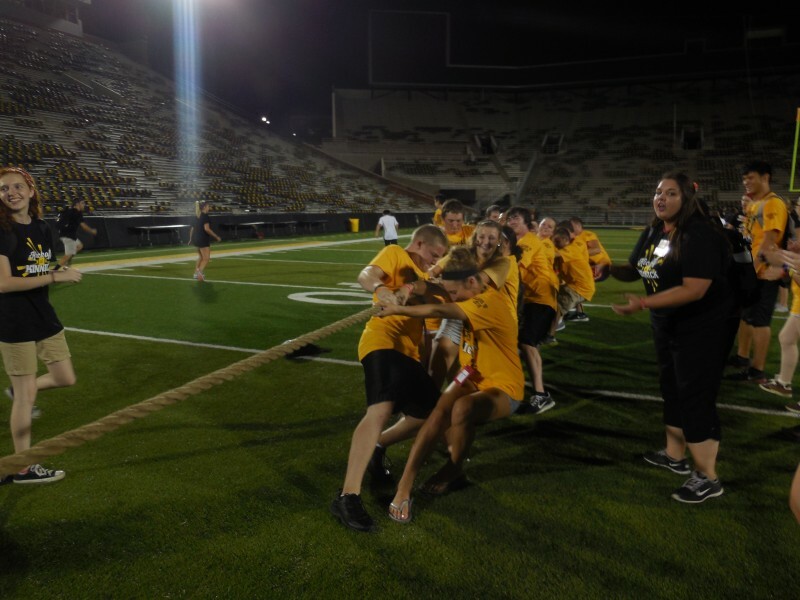 Although the black team put up a good fight, the gold did win the tug-of war. I’m so excited for today! I can’t wait to see my Small Group again! I’m bringing candy for them. They just don’t know that I’m going to make them do an icebreaker for it! 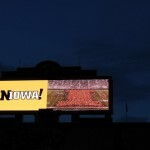 So until later… OnIowa! Go Hawks!